Yesterday, the Bureau of Economic Analysis released new statistics on GDP for the nation’s metropolitan areas. The BEA reported that the average growth rate for U.S. metro areas in 2014 was 2.3%. Among metro areas that cover parts of Arkansas, only Fayetteville (at 3.1%) exceeded that average. In fact, five of the state’s eight metro areas showed negative growth in 2014. Pine Bluff experienced the largest contraction, -3.0%. Over the five year period since the trough of the 2008-2009 recession, Arkansas’ metro areas have shown a wide range of growth rates. From 2009-2014, Fayetteville’s GDP expanded by 25.8% and Hot Springs’ by 20.8%. 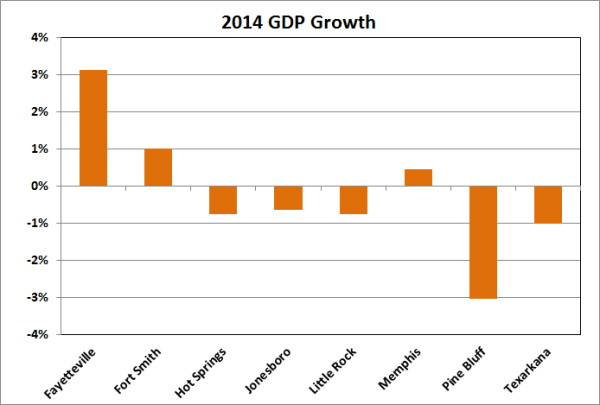 At the other extreme, GDP in Pine Bluff has declined by 8.5%. The newly-released statistics are preliminary and incomplete, and are therefore subject to future revision. 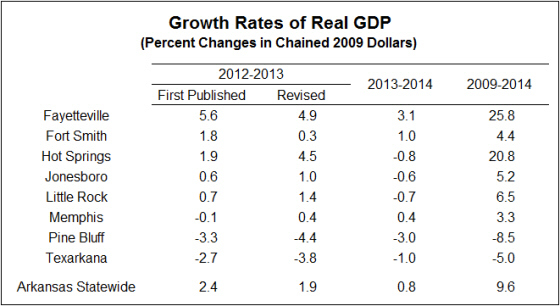 As shown in the table, as well as in the figure below, revisions to GDP growth rates can be substantial. 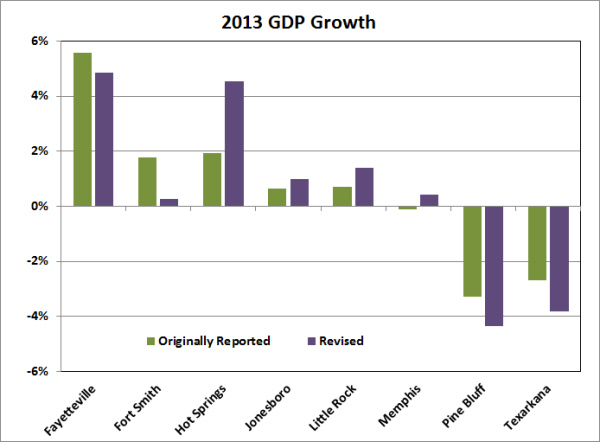 For example, 2013 GDP growth for Hot Springs was revised upward from 1.9% to 4.5%. 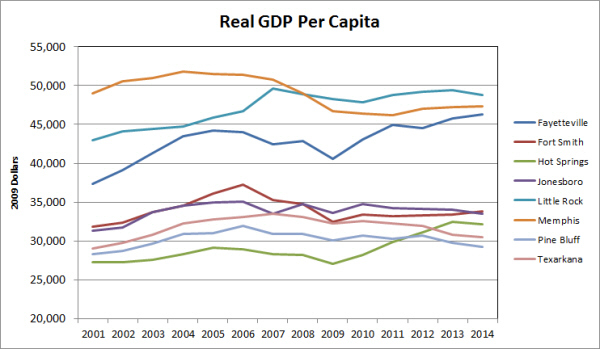 The BEA report also included information on per capita GDP, which might be considered a better indicator of economic performance (because it accounts for differences in population growth). Statewide, GDP per capita in 2014 was $37,334 (in 2009 inflation-adjusted dollars), amounting to 75.5% of the U.S. figure of $49,469. Little Rock had the highest per capita GDP, but at $48,773, still fell slightly below the national level. 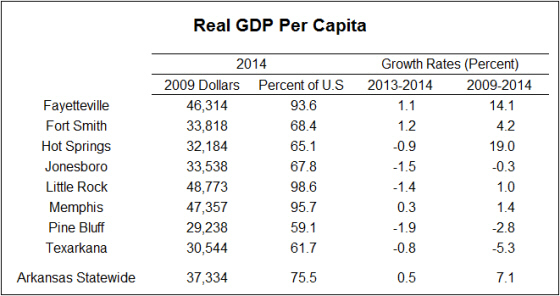 Pine Bluff had the lowest per capita GDP, $29,238 or 59.1% of the U.S. average.